Warm air heating is installed in a vast number of factories in the United Kingdom and are probably the most commonly employed industrial heating systems for industry. 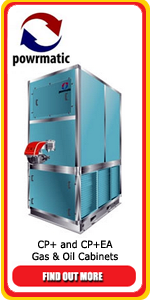 Warm air is provided through either floor standing cabinet or suspended unit type heaters and provide a highly efficient and robust solution for most industries. These are highly efficient, powerful heating units which are positioned on the floor and are equipped with much larger heat outputs than their unit heater counterparts. In addition to being highly cost efficient, they are a very quick and effective way of heating a factory space. These self-contained heating units are commonly suspended from a workshop or factory roof, or are positioned on an internal flat roof. They offer a highly efficient heating solution for smaller units, where floor space is at a premium. Heathcrest Heating Limited specialises in installing industrial and commercial heating systems in a wide variety of locations. These can be as diverse as factories and warehouses, shops and workshops, or sports facilities and religious buildings. For free advice on Commercial & Industrial heating systems and hot water systems call us on 01494 771211 or fill out our email enquiry form.